Before an imposing band of 14 - one that included two of rock's most intrepid frontmen - no one claimed center stage. Peter Gabriel was stashed far left, behind an enormous keyboard command center as he chirped his stirring "Games Without Frontiers." Across the rise waited Sting, who had no quarrels harmonizing in the periphery, with a troupe backup singers. Gabriel would soon leave his post to fetch his longtime friend, and both delivered the "Games" chorus while they strolled in step, around the BB&T Pavilion stage. The mood was sunny; the countrymen born two years (and about 300 miles) apart in the U.K. joked at the show's outset about milking cows in Gabriel's hometown, then proclaimed their merged set would be something of "karaoke in Camden." The duo's new, co-headlining gig - deemed the unassuming Rock Paper Scissors tour - was imbued Sunday with a sense of humble camaraderie as two, hit-soaked sets were intertwined to shape a sprawling, singular performance project. Neither of the stars left the stage for long; while one rocked a few of his tunes with the shared a band, the other often supplemented the jam, or even took lead to add a new wrinkle. The seesawing aesthetic was not only a bright revival of two explosive careers - a smart touring strategy regarding fan overlap - but a further representation of the artists' penchant for collaboration. Gabriel (Kate Bush, Sinead O'Connor, Trent Reznor) and Sting (need we go beyond "Do They Know It's Christmas?") have always welcomed others into their fold, and consequently penned two of the more eclectic, world-inspired songbooks in the rock sphere. 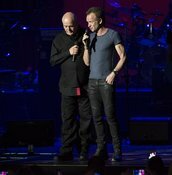 And this tour isn't exactly a new union; Gabriel, 66, and Sting, 64 have performed together before, for the human rights group Amnesty International, beginning in the late '80s. But Sunday's more immersive blueprint forged a list of fresh, privileged moments for the crowd of about 25,000. Where else might they see Sting wail Gabriel's "Shock The Monkey" in its entirety, or Gabriel steal a verse in "Englishman in New York"? Occasions where the pair worked in immediate tandem spurred the greatest goosebumps, as for "In Your Eyes" where the two stood shoulder-to-shoulder and belted into one microphone. Still, the show allowed some space for each of the Brits to rule separately. Before his poignant solo number "Fragile," Sting addressed the recent tragedy in Orlando. "The only way we can combat unspeakable hatred is with empathy and solidarity," he said, to wild cheers. Later, Gabriel similarly dedicated "Love Can Heal" to his friend Jo Cox, a British politician who was assassinated June 16. Each singer was gracious, and both vocals seemed well rested, but tugging styles would eventually clash a little. After Sting turned in an expectedly buoyant "Message In A Bottle" on bass guitar, Gabriel immediately transitioned into the brooding histrionics of his own "Darkness," and eviscerated the merry atmosphere. The GoPro camera mounted to his microphone, to provide an uncomfortably close frame of his face, was brutally unflattering - Uncle Fester came to mind. But such was the night's arc: whenever Gabriel's sweeping sonic dramas brought the audience somewhere a bit too somber, Sting's nimble Police and solo work swooped in to let them off the hook. Visually, the night's one great spectacle was not the array of digital screens hung above the stage, but the patchwork band itself - Gabriel's players dressed in black and red, Sting's in blue - who totaled three percussionists, two synths without Gabriel himself, strings and more. Somehow, there was room for a few solos, too. Backup singer Jo Lawry unleashed a ethereal soprano showcase on Sting's "The Hounds Of Winter," and violinist Peter Tickell delivered a furious solo on "Driven To Tears," with a GoPro camera strapped to his instrument. Again, the frontmen were happy to share the stage. 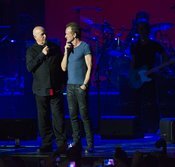 The concept of a concert featuring Sting and Peter Gabriel together proved to be inspired when the British iconoclasts shared a stage Sunday at the B,B&T Pavilion. Sting and Gabriel have enough similarities and differences to make a show work well. Both recording artists are uncompromising, artsy and know how to deliver a big hook. And then there are the differences. Gabriel is the godfather of prog-rock, courtesy of his work with Genesis, and he has embraced world music as a solo artist. Sting and the Police were an innovative, constantly morphing band that could drop infectious pop songs as easily as reggae-rock cuts. Sting opted for a more introspective and, at times, jazzy solo career. The hits were delivered. “Roxanne,” “Big Time” and “In Your Eyes” sated the mellow crowd, which comprised primarily baby boomers. But it was much more than the songs. 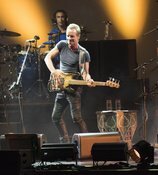 Each left the stage for intervals while the other star took the solo spotlight, but it was obvious that Sting and Gabriel really enjoy performing together on this limited “Rock, Paper, Scissors” tour. There was palpable joy and respect during the satisfying 29-song set, which was capped by versions of “Every Breath You Take” and “Sledgehammer.” Some songs were replicated and others were delivered with a new arrangement. It all worked. The enthusiasm conveyed was as valuable as any song rendered. Will Sting and Gabriel make like Elton John and Billy Joel and reprise their tour after it ends in late July? Hopefully, but if not, fans can look back at “Rock, Paper, Scissors,” which was this region's concert of the month. If you are a paid member of the fan club then your unique passcode will be visible on the tour page when you are logged in. You must be logged in to access your code. Will we be purchasing the tickets through this website? If not, is there a promo code?